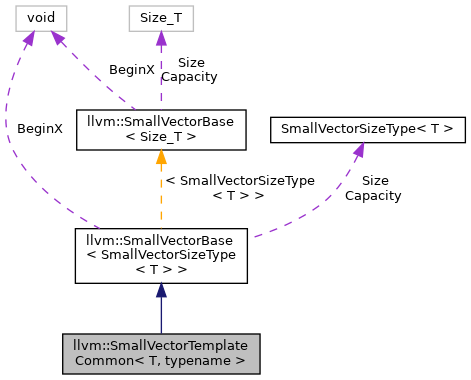 This is the part of SmallVectorTemplateBase which does not depend on whether the type T is a POD. The extra dummy template argument is used by ArrayRef to avoid unnecessarily requiring T to be complete. Definition at line 82 of file SmallVector.h. Definition at line 116 of file SmallVector.h. Definition at line 124 of file SmallVector.h. Definition at line 122 of file SmallVector.h. Definition at line 118 of file SmallVector.h. Definition at line 113 of file SmallVector.h. Definition at line 115 of file SmallVector.h. 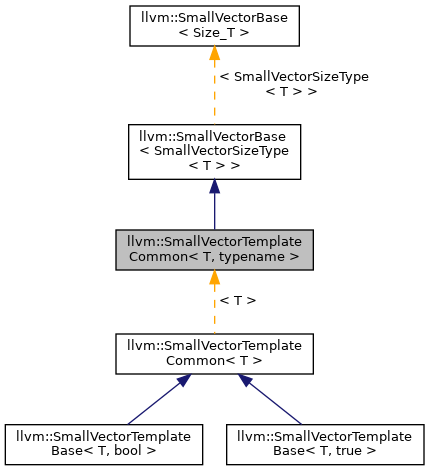 Definition at line 123 of file SmallVector.h. Definition at line 121 of file SmallVector.h. Definition at line 119 of file SmallVector.h. Definition at line 112 of file SmallVector.h. Definition at line 114 of file SmallVector.h. Definition at line 94 of file SmallVector.h. Definition at line 166 of file SmallVector.h. Referenced by llvm::MachineInstr::addRegisterDead(), llvm::MachineInstr::addRegisterKilled(), llvm::object::ExportEntry::address(), AdjustStackOffset(), advanceToNextLeafType(), llvm::A57ChainingConstraint::apply(), buildGEP(), buildMultiplyTree(), canUseReferenceType(), llvm::ARMFrameLowering::determineCalleeSaves(), eliminateDeadSwitchCases(), llvm::UnwindOpcodeAssembler::EmitRaw(), llvm::LiveRange::endIndex(), llvm::BitstreamCursor::EnterSubBlock(), llvm::SparseSet< unsigned, llvm::VirtReg2IndexFunctor >::erase(), llvm::DominatorTreeBase< BasicBlock, false >::eraseNode(), ExposePointerBase(), firstRealType(), FitWeights(), llvm::object::ExportEntry::flags(), llvm::StackSafetyInfo::FunctionInfo::FunctionInfo(), GetBranchWeights(), getCombinerObjective(), llvm::RegionInfoBase< RegionTraits< Function > >::getCommonRegion(), llvm::safestack::StackLayout::getFrameSize(), getPrefixes(), getRelevantOperands(), llvm::ImutAVLTreeGenericIterator< ImutInfo >::getVisitState(), llvm::LiveVariables::HandleVirtRegDef(), insertUndefLaneMask(), instIsBreakpoint(), isMatchingOrAlias(), IsNonLocalValue(), IsSafeAndProfitableToMove(), llvm::IntervalMapImpl::Path::leaf(), llvm::IntervalMapImpl::Path::leafOffset(), llvm::IntervalMapImpl::Path::leafSize(), llvm::PPCInstrInfo::loadRegFromStackSlot(), llvm::object::ExportEntry::moveNext(), needsReferenceType(), nextRealType(), llvm::object::ExportEntry::nodeOffset(), llvm::ImutAVLTreeGenericIterator< ImutInfo >::operator*(), llvm::ImutAVLTreeGenericIterator< ImutInfo >::operator++(), llvm::ImutAVLTreeGenericIterator< ImutInfo >::operator--(), llvm::object::ExportEntry::other(), packCmovGroup(), ParseFunctionArgs(), llvm::WebAssemblyInstPrinter::printInst(), llvm::sampleprof::SampleProfileReaderText::read(), llvm::BitstreamCursor::ReadBlockEnd(), RefineErrorLoc(), regOverlapsSet(), llvm::returnTypeIsEligibleForTailCall(), llvm::ImutAVLTreeGenericIterator< ImutInfo >::skipToParent(), sortBlocks(), llvm::DbgValueHistoryMap::startClobber(), llvm::PPCInstrInfo::storeRegToStackSlot(), llvm::MCStreamer::SwitchSection(), and llvm::codeview::ContinuationRecordBuilder::writeMemberType(). Definition at line 170 of file SmallVector.h. Definition at line 127 of file SmallVector.h. Referenced by addData(), addHints(), llvm::SpillPlacement::Node::addLink(), llvm::FoldingSetNodeID::AddNodeID(), llvm::MipsInstrInfo::analyzeBranch(), llvm::SmallString< 256 >::append(), llvm::RegsForValue::append(), llvm::SmallString< 256 >::assign(), llvm::LiveRangeEdit::begin(), llvm::SparseSet< unsigned, llvm::VirtReg2IndexFunctor >::begin(), llvm::HexagonShuffler::begin(), llvm::opt::ArgList::begin(), llvm::LiveRange::begin(), llvm::RegBankSelect::RepairingPlacement::begin(), CheckBundleSubtargets(), llvm::GraphTraits< VPBlockBase * >::child_begin(), llvm::GraphTraits< const VPBlockBase * >::child_begin(), llvm::GraphTraits< Inverse< VPBlockBase * > >::child_begin(), llvm::LoopVectorizationPlanner::collectTriviallyDeadInstructions(), llvm::LoopVectorizationCostModel::collectValuesToIgnore(), llvm::DominatorTreeBase< BasicBlock, false >::compare(), llvm::MCCodePaddingPolicy::computeFirstWindowPenaltyWeight(), llvm::safestack::StackLayout::computeLayout(), copyBytesForDefRange(), createUniqueEntity(), llvm::createX86OptimizeLEAs(), CriticalPathStep(), deleteDeadBlocksFromLoop(), llvm::MachineRegisterInfo::disableCalleeSavedRegister(), doesIgnoreDataTypeSuffix(), llvm::DomTreeUpdater::dump(), llvm::DWARFContext::dwo_info_section_units(), llvm::DWARFContext::dwo_types_section_units(), llvm::DWARFContext::dwo_units(), eliminateDeadSwitchCases(), llvm::MCWasmStreamer::EmitIdent(), llvm::MCWinCOFFStreamer::EmitInstToData(), llvm::MCObjectStreamer::EmitInstToFragment(), llvm::UnwindOpcodeAssembler::EmitRaw(), llvm::DILocation::encodeDiscriminator(), llvm::mca::InstructionTables::execute(), llvm::cl::ExpandResponseFiles(), llvm::opt::ArgList::filtered(), llvm::SSAUpdaterImpl< UpdaterT >::FindAvailableVals(), findBuildAggregate(), findBuildVector(), llvm::SSAUpdaterImpl< UpdaterT >::FindExistingPHI(), llvm::SlotIndexes::findMBBIndex(), FitWeights(), llvm::DomTreeUpdater::flush(), llvm::FoldBranchToCommonDest(), llvm::RegScavenger::forward(), llvm::DomTreeBuilder::SemiNCAInfo< DomTreeT >::ChildrenGetter< Inverse >::Get(), llvm::GraphDiff< llvm::BasicBlock *, IsPostDom >::getAddedChildren(), GetAEABIUnwindPersonalityName(), llvm::opt::ArgList::getAllArgValues(), llvm::opt::Arg::getAsString(), llvm::DebugLocStream::getBytes(), getChainID(), getDebugLocValue(), llvm::BlockFrequencyInfoImplBase::LoopData::getHeaderIndex(), llvm::BasicTTIImplBase< AMDGPUTTIImpl >::getIntrinsicInstrCost(), llvm::MachineTraceMetrics::Ensemble::getLoopFor(), llvm::DOTGraphTraits< BoUpSLP * >::getNodeAttributes(), llvm::DomTreeUpdater::getPostDomTree(), llvm::RegScavenger::getScavengingFrameIndices(), getSchedRegions(), getStartOrEndSlot(), llvm::yaml::ScalarNode::getValue(), llvm::LiveVariables::HandleVirtRegDef(), hasTiedDef(), llvm::ExtractValueInst::idx_begin(), llvm::InsertValueInst::idx_begin(), llvm::DWARFContext::info_section_units(), INITIALIZE_PASS(), llvm::slpvectorizer::BoUpSLP::BlockScheduling::ReadyList::insert(), llvm::MipsAnalyzeImmediate::Inst::Inst(), is_ns_word_char(), isACalleeSavedRegister(), llvm::BlockFrequencyInfoImplBase::LoopData::isHeader(), isOperandKill(), llvm::DomTreeBuilder::SemiNCAInfo< DomTreeT >::isPermutation(), llvm::RegScavenger::isScavengingFrameIndex(), isTerminalReg(), llvm::LoopVectorizationLegality::isUniform(), llvm::MipsSEInstrInfo::loadImmediate(), LoopIsOuterMostWithPredecessor(), lowerV16I8Shuffle(), lowerV8I16GeneralSingleInputShuffle(), MaybePredicatedInst(), mayLoopAccessLocation(), llvm::SlotIndexes::MBBIndexBegin(), llvm::MCELFStreamer::MCELFStreamer(), llvm::BlockFrequencyInfoImplBase::LoopData::members_begin(), MergeAliasResults(), llvm::sys::path::native(), needsReferenceType(), llvm::DWARFContext::normal_units(), llvm::mca::ExecuteStage::notifyReservedOrReleasedBuffers(), llvm::RegsForValue::occupiesMultipleRegs(), false::IntervalSorter::operator()(), llvm::SmallVectorImpl< std::pair< llvm::RelocationValueRef, llvm::RelocationEntry > >::operator<(), llvm::SmallVectorImpl< std::pair< llvm::RelocationValueRef, llvm::RelocationEntry > >::operator==(), llvm::DWARFDebugLoclists::parseOneLocationList(), propagateMetadata(), llvm::sampleprof::SampleProfileReaderGCC::readOneFunctionProfile(), llvm::SSAUpdaterImpl< UpdaterT >::RecordMatchingPHIs(), llvm::InnerLoopVectorizer::recordVectorLoopValueForInductionCast(), llvm::HexagonInstrInfo::reduceLoopCount(), llvm::sys::path::remove_filename(), RemoveInstInputs(), llvm::opt::Arg::render(), llvm::opt::Arg::renderAsInput(), reorderSubVector(), llvm::sys::path::replace_extension(), llvm::sys::path::replace_path_prefix(), llvm::ARMTargetLowering::ReplaceNodeResults(), llvm::IntervalMapImpl::Path::replaceRoot(), llvm::GlobalDCEPass::run(), llvm::SpeculateAroundPHIsPass::run(), llvm::SwingSchedulerDAG::schedule(), llvm::MipsCallLowering::MipsHandler::setLeastSignificantFirst(), llvm::HexagonShuffler::shuffle(), llvm::SmallVectorMemoryBuffer::SmallVectorMemoryBuffer(), llvm::sortPtrAccesses(), llvm::MachineBasicBlock::SplitCriticalEdge(), llvm::JumpThreadingPass::ThreadEdge(), llvm::APInt::toString(), llvm::DWARFContext::types_section_units(), llvm::GCOVBlock::unblock(), llvm::SpillPlacement::Node::update(), llvm::BlockFrequencyInfoImplBase::updateLoopWithIrreducible(), llvm::LiveRange::vni_begin(), llvm::WriteBitcodeToFile(), and llvm::ManagedStringPool::~ManagedStringPool(). Definition at line 128 of file SmallVector.h. Definition at line 141 of file SmallVector.h. Definition at line 144 of file SmallVector.h. Referenced by llvm::zlib::compress(), llvm::opt::ArgList::eraseArg(), llvm::MachineRegisterInfo::getCalleeSavedRegs(), llvm::pdb::DIARawSymbol::getDataBytes(), llvm::MachineTraceMetrics::getProcResourceCycles(), llvm::MachineTraceMetrics::Ensemble::getProcResourceDepths(), llvm::MachineTraceMetrics::Ensemble::getProcResourceHeights(), llvm::InitLLVM::InitLLVM(), lowerV8I16GeneralSingleInputShuffle(), llvm::sys::fs::make_absolute(), llvm::sys::path::native(), llvm::FoldingSetNodeID::operator<(), llvm::FoldingSetNodeID::operator==(), llvm::readPGOFuncNameStrings(), llvm::sys::path::remove_dots(), llvm::raw_svector_ostream::str(), llvm::Twine::toNullTerminatedStringRef(), llvm::Twine::toStringRef(), and llvm::zlib::uncompress(). Definition at line 146 of file SmallVector.h. Definition at line 129 of file SmallVector.h. Referenced by addData(), addHints(), llvm::SpillPlacement::Node::addLink(), llvm::FoldingSetNodeID::AddNodeID(), llvm::SlotIndexes::advanceMBBIndex(), llvm::SmallString< 256 >::append(), llvm::RegsForValue::append(), llvm::SmallString< 256 >::assign(), llvm::opt::ArgList::begin(), CheckBundleSubtargets(), llvm::GraphTraits< VPBlockBase * >::child_end(), llvm::GraphTraits< const VPBlockBase * >::child_end(), llvm::GraphTraits< Inverse< VPBlockBase * > >::child_end(), llvm::LoopVectorizationPlanner::collectTriviallyDeadInstructions(), llvm::LoopVectorizationCostModel::collectValuesToIgnore(), llvm::DominatorTreeBase< BasicBlock, false >::compare(), llvm::MCCodePaddingPolicy::computeFirstWindowPenaltyWeight(), llvm::safestack::StackLayout::computeLayout(), llvm::rdf::Liveness::computePhiInfo(), copyBytesForDefRange(), llvm::createX86OptimizeLEAs(), CriticalPathStep(), deleteDeadBlocksFromLoop(), llvm::ARMFrameLowering::determineCalleeSaves(), llvm::MachineRegisterInfo::disableCalleeSavedRegister(), llvm::DomTreeUpdater::dump(), llvm::DWARFContext::dwo_types_section_units(), llvm::DWARFContext::dwo_units(), eliminateDeadSwitchCases(), llvm::MCWasmStreamer::EmitIdent(), llvm::MCWinCOFFStreamer::EmitInstToData(), llvm::MCObjectStreamer::EmitInstToFragment(), llvm::UnwindOpcodeAssembler::EmitRaw(), llvm::DILocation::encodeDiscriminator(), llvm::LiveRangeEdit::end(), llvm::SparseSet< unsigned, llvm::VirtReg2IndexFunctor >::end(), llvm::HexagonShuffler::end(), llvm::opt::ArgList::end(), llvm::LiveRange::end(), llvm::RegBankSelect::RepairingPlacement::end(), llvm::DominatorTreeBase< BasicBlock, false >::eraseNode(), llvm::mca::InstructionTables::execute(), llvm::cl::ExpandResponseFiles(), llvm::SSAUpdaterImpl< UpdaterT >::FindAvailableVals(), findBuildAggregate(), findBuildVector(), llvm::SSAUpdaterImpl< UpdaterT >::FindExistingPHI(), FitWeights(), llvm::DomTreeUpdater::flush(), llvm::FoldBranchToCommonDest(), llvm::RegScavenger::forward(), llvm::DomTreeBuilder::SemiNCAInfo< DomTreeT >::ChildrenGetter< Inverse >::Get(), llvm::GraphDiff< llvm::BasicBlock *, IsPostDom >::getAddedChildren(), GetAEABIUnwindPersonalityName(), llvm::opt::ArgList::getAllArgValues(), llvm::opt::Arg::getAsString(), llvm::DebugLocStream::getBytes(), getDebugLocValue(), llvm::BasicTTIImplBase< AMDGPUTTIImpl >::getIntrinsicInstrCost(), getNaturalGEPWithType(), llvm::RegScavenger::getScavengingFrameIndices(), getSchedRegions(), getStartOrEndSlot(), llvm::yaml::ScalarNode::getValue(), llvm::RegisterBankInfo::OperandsMapper::getVRegs(), llvm::LiveVariables::HandleVirtRegDef(), hasTiedDef(), llvm::ExtractValueInst::idx_end(), llvm::InsertValueInst::idx_end(), INITIALIZE_PASS(), llvm::slpvectorizer::BoUpSLP::BlockScheduling::ReadyList::insert(), llvm::MipsAnalyzeImmediate::Inst::Inst(), is_ns_word_char(), isACalleeSavedRegister(), isOperandKill(), llvm::DomTreeBuilder::SemiNCAInfo< DomTreeT >::isPermutation(), llvm::RegScavenger::isScavengingFrameIndex(), isTerminalReg(), llvm::MipsSEInstrInfo::loadImmediate(), llvm::BlockFrequencyInfoImplBase::LoopData::LoopData(), LoopIsOuterMostWithPredecessor(), lowerV16I8Shuffle(), lowerV8I16GeneralSingleInputShuffle(), mayLoopAccessLocation(), llvm::SlotIndexes::MBBIndexEnd(), llvm::MCELFStreamer::MCELFStreamer(), llvm::BlockFrequencyInfoImplBase::LoopData::members_end(), llvm::sys::path::native(), needsReferenceType(), llvm::DWARFContext::normal_units(), llvm::mca::ExecuteStage::notifyReservedOrReleasedBuffers(), llvm::RegsForValue::occupiesMultipleRegs(), false::IntervalSorter::operator()(), llvm::SmallVectorImpl< std::pair< llvm::RelocationValueRef, llvm::RelocationEntry > >::operator<(), llvm::sampleprof::SampleProfileReaderGCC::readOneFunctionProfile(), llvm::InstrProfReaderItaniumRemapper< HashTableImpl >::reconstituteName(), llvm::SSAUpdaterImpl< UpdaterT >::RecordMatchingPHIs(), llvm::HexagonInstrInfo::reduceLoopCount(), RemoveInstInputs(), llvm::opt::Arg::render(), llvm::opt::Arg::renderAsInput(), llvm::ARMTargetLowering::ReplaceNodeResults(), llvm::SwingSchedulerDAG::schedule(), llvm::MipsCallLowering::MipsHandler::setLeastSignificantFirst(), llvm::HexagonShuffler::shuffle(), llvm::SmallVectorMemoryBuffer::SmallVectorMemoryBuffer(), llvm::sortPtrAccesses(), llvm::MachineBasicBlock::SplitCriticalEdge(), llvm::JumpThreadingPass::ThreadEdge(), llvm::APInt::toString(), llvm::DWARFContext::types_section_units(), llvm::GCOVBlock::unblock(), llvm::SpillPlacement::Node::update(), llvm::BlockFrequencyInfoImplBase::updateLoopWithIrreducible(), VerifySubExpr(), llvm::LiveRange::vni_end(), and llvm::ManagedStringPool::~ManagedStringPool(). Definition at line 130 of file SmallVector.h. Definition at line 157 of file SmallVector.h. Referenced by llvm::RegsForValue::AddInlineAsmOperands(), llvm::LiveRange::beginIndex(), llvm::ARMFrameLowering::determineCalleeSaves(), GetBranchWeights(), llvm::DwarfDebug::isLexicalScopeDIENull(), llvm::codeview::CodeViewRecordIO::maxFieldLength(), packCmovGroup(), llvm::rdf::DataFlowGraph::pushAllDefs(), llvm::sampleprof::SampleProfileReaderGCC::readOneFunctionProfile(), llvm::IntervalMapImpl::Path::replaceRoot(), llvm::DominatorTreeBase< BasicBlock, false >::setNewRoot(), llvm::IntervalMapImpl::Path::valid(), llvm::WriteBitcodeToFile(), llvm::WriteIndexToFile(), and llvm::WriteThinLinkBitcodeToFile(). Definition at line 161 of file SmallVector.h. Definition at line 97 of file SmallVector.h. Return true if this is a smallvector which has not had dynamic memory allocated for it. Definition at line 103 of file SmallVector.h. Definition at line 139 of file SmallVector.h. Definition at line 148 of file SmallVector.h. Definition at line 152 of file SmallVector.h. Definition at line 133 of file SmallVector.h. Referenced by llvm::SSAUpdaterImpl< UpdaterT >::FindAvailableVals(), llvm::SSAUpdaterImpl< UpdaterT >::FindDominators(), llvm::SSAUpdaterImpl< UpdaterT >::FindPHIPlacement(), llvm::rdf::Liveness::getNearestAliasedRef(), getNoopInput(), llvm::vfs::OverlayFileSystem::overlays_begin(), llvm::WebAssemblyInstPrinter::printInst(), llvm::opt::ArgList::rbegin(), and llvm::returnTypeIsEligibleForTailCall(). Definition at line 134 of file SmallVector.h. Definition at line 135 of file SmallVector.h. Referenced by llvm::opt::ArgList::filtered_reverse(), llvm::SSAUpdaterImpl< UpdaterT >::FindAvailableVals(), llvm::SSAUpdaterImpl< UpdaterT >::FindDominators(), llvm::SSAUpdaterImpl< UpdaterT >::FindPHIPlacement(), llvm::rdf::Liveness::getNearestAliasedRef(), llvm::vfs::OverlayFileSystem::overlays_end(), llvm::opt::ArgList::rbegin(), llvm::opt::ArgList::rend(), and llvm::returnTypeIsEligibleForTailCall(). Definition at line 136 of file SmallVector.h. Definition at line 106 of file SmallVector.h. Definition at line 138 of file SmallVector.h.